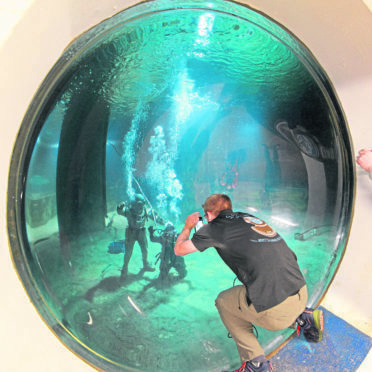 The view through the hemispherical window Paul (Ginge) Guiver tries out his vintage suit in the tank at Fort Williams Underwater Centre. Picture Iain Ferguson. For many just climbing Britain’s highest mountain is enough of a challenge – but today a team of divers will attempt something that has not been done before. Veteran climber Ginge Fullen will lead a team of eight from 16 feet beneath Loch Linnhe to the 4413 foot peak while wearing historic deep sea diving gear weighing 176 pounds. The Sub Sea to Summit challenge was created by Mr Fullen who has combined his career a former Royal Navy clearance diver with climbing the highest mountains in more than 170 countries. The challenge will be great because the person in the suit will not be able to look down to place their feet or else they will tilt over due to the weight of the helmet – so they will have to climb almost upright. That as the boots weigh almost 20 pounds each, the helmet around 50 pounds add to that weights front and back and the whole suit comes to 176 pounds. The first man into the suit will be Ty Burton from the Historical Diving Society who aims to emerge from the waters around 10am. From then on the team will go up as a relay with the person in the diver’s suit being changed over every 110 yards until the team gains the peak, four or five days later. Asked what gave Mr Fullen the idea he said: “Well, it has been in the back of my mind for a while. I was a former Navy Clearance Diver and I have climbed lots of mountains so I wanted to combine the two. The money raised – aiming for at least £1 per foot climbed – will got to Lochaber Mountain Rescue and the family and the family Thai Navy diver Saman Kunan who died while trying to rescue a football team and their coach from flooded caves in Thailand. One of Mr Kunan’s friends from Thailand made the trip over and will be helping with the climb.